The northern and southern hemispheres of Titan are seen in these polar stereographic maps, assembled in 2015 using the best-available images of the giant Saturnian moon from NASA's Cassini mission. 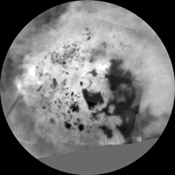 The images were taken by Cassini's imaging cameras using a spectral filter centered at 938 nanometers, allowing researchers to examine variations in albedo (or inherent brightness) across the surface of Titan. These maps utilize imaging data collected through Cassini's flyby on April 7, 2014, known as "T100." 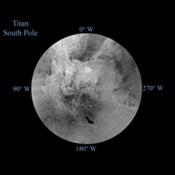 Titan's north pole was not well illuminated early in Cassini's mission, because it was winter in the northern hemisphere when the spacecraft arrived at Saturn. Cassini has been better able to observe northern latitudes in more recent years due to seasonal changes in solar illumination. Compared to the previous version of Cassini's north polar map (see PIA11146), this map provides much more detail and fills in a large area of missing data. The imaging data in these maps complement Cassini synthetic aperture radar (SAR) mapping of Titan's north pole (see PIA17655). Lakes are also seen in the southern hemisphere map, but they are much less common than in the north polar region. Only a lakes have been confirmed in the south. 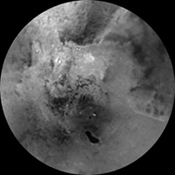 The dark, footprint-shaped feature at 180 degrees west is Ontario Lacus; a smaller lake named Crveno Lacus can be seen as a very dark spot just above Ontario. 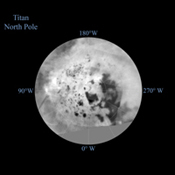 The dark-albedo area seen at the top of the southern hemisphere map (at 0 degrees west) is an area called Mezzoramia. Each map is centered on one of the poles, and surface coverage extends southward to 60 degrees latitude. Grid lines indicate latitude in 10-degree increments and longitude in 30-degree increments. The scale in the full-size versions of these maps is 4,600 feet (1,400 meters) per pixel. The mean radius of Titan used for projection of these maps is 1,600 miles (2,575 kilometers).